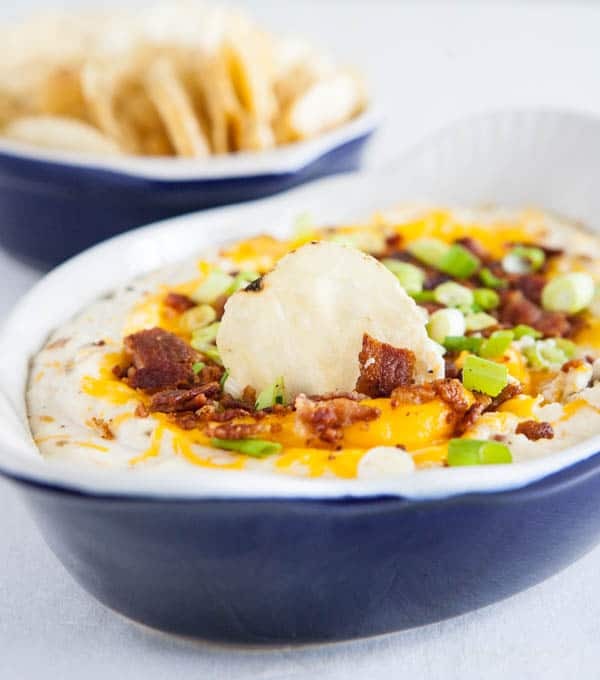 How many of you love a good loaded baked potato? I know we do, it’s one of my guilty pleasures every time we go to a steakhouse. I also love to make a loaded mashed potato casserole on the holidays. 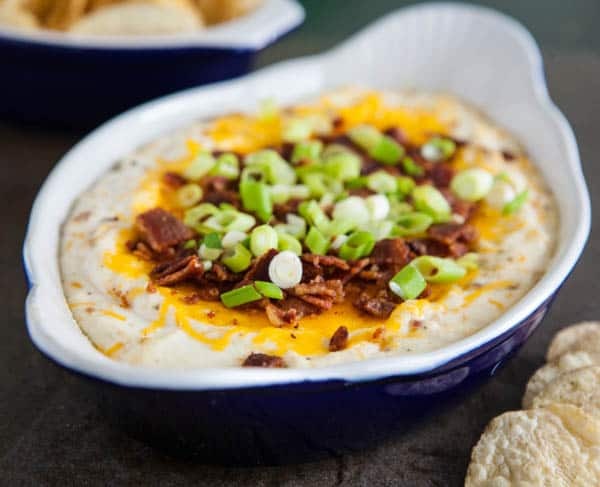 The flavor of mashed potatoes, sour cream cheese and crunchy bacon, it’s so good! 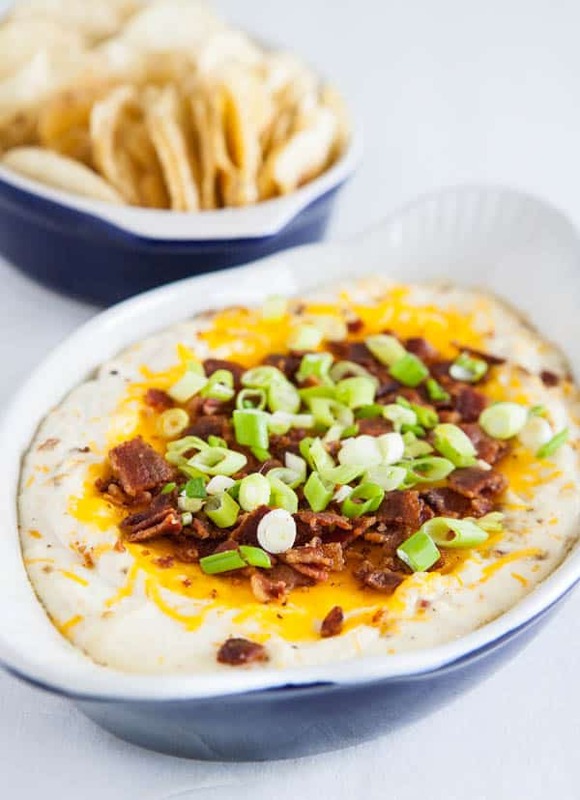 Well if you love loaded potatoes as much as me, you’ll fall head over heals for this loaded potato chip dip. I start with some instant potato flakes, add lots of sour cream, some cheddar cheese, and a ton of crispy bacon. For added flavor I used some onion and garlic powder along with salt and pepper. But you could also use a packet of ranch dressing mix or onion soup mix to give the potato and sour cream layer more flavor. After a short bake in the oven, you’ve got the most delicious hot dip perfect for some good crunchy potato chips. We like to use Kettle Brand Potato Chips. Their hearty, crunchy texture works great with this dip. Heat oven to 350°. Combine potato flakes and milk in a small bowl and mix well to combine. Heat in the microwave on high for 20 seconds. Add this potato mixture to a larger bowl with the sour cream, salt and pepper, onion powder and garlic powder. Add half the cheese and half the bacon. Mix well. Spread mixture into a small casserole or pie plate. Sprinkle remaining cheese on top and place in the oven to bake for 15 - 17 minutes. Remove from oven and top with reserved bacon and green onions. Serve warm with potato chips. Goodness – I could dive headfirst into this irresistible dip! Such a great idea! i love a loaded baked potato. Yes. I would eat this with a spoon. Hi Angie! Just wanted to let you know that I featured this recipe (with full credit and a link-back) in a dip recipe roundup today on Foxes Love Lemons. Have a great day! I am definetly going to try this tonight!